Henan Kingman M&E Complete Plant Co.,Ltd is one of the leading Chinese companies who has specialised in the design and manufacture of equipment and complete plants for the recycling industry, compound feed industry and grain processing. We give a full set of services, including consultation on pellet technologies and planning of manufacture, delivery, installation, guarantee and after sales guarantee service, maintenance with spare parts. Pelletizing is the process of making waste materials into solid fuel. The objects areused for burning purposes. Wood Pellet is one of the most commonly used pelletizing materials. 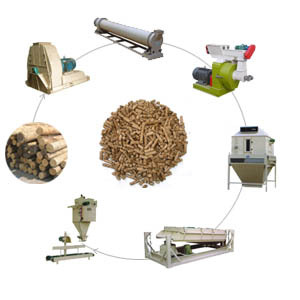 Wood pellet can be made from sawdust, wood shavings, wood chips or wood logs, any wood wastes. Depending on the input product, which can be dry wood shavings, wet sawdust, wood chip and etc. Directly before the pelleting press, a product with a granular size of approx. 4 mm and a residual moisture content of approx. 15 % is required. The mainly processes are:Wood crushing(if the raw material is not already granulated), material sifter,drying(if the raw material contains too much moisture), pelletizing, cooling and bagging. The whole process is highly automatically controlled. 1 metric ton per hour to 6 metric ton per hour are available.